Frugal gardeners wisely use anything they can to create a more productive garden. If you or a neighbor has had to cut down a tree, create a new raised bed using the logs as a soil barrier. The fluffy, nutrient-rich soil of a raised bed will grow more abundant crops, resulting in a larger, healthier harvest at the end of the season. Just don't forget to share the wealth with the neighbor who donated the logs. Lay out the shape of your bed by laying the logs on the ground in a rough outline. The bed should be about 4 feet wide, but the length depends on how many logs you have to use. 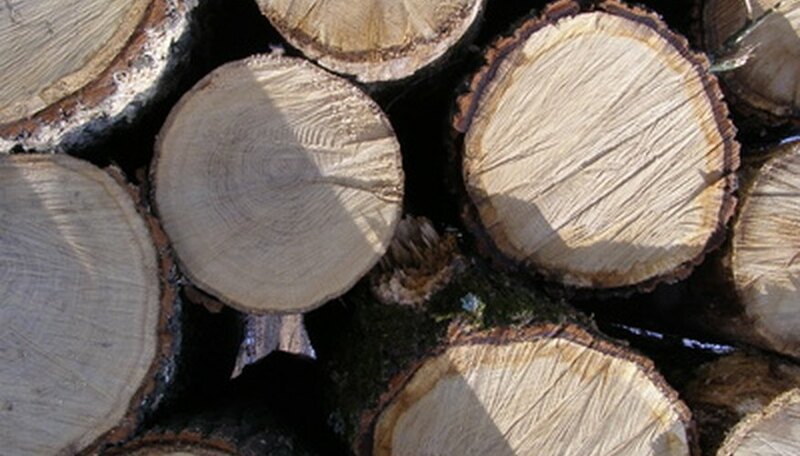 Cut longer logs lengths if you need to, to keep the width to about 4 feet. Dig the raised bed area to a depth of 12 inches. Remove all the rocks and roots that you can find. Rake through the soil to remove lumps. The smoother the soil becomes, the easier the roots can grow and take hold, making it easier for them to grow stronger. Lay the logs around the edge of the bed with the lower edge just inside the rectangle. The logs should lay on the exposed earth, but just at the edge of the dug patch. Most of the logs will stay above the ground to hold in the extra soil that you will add to the bed. Push the ends of the logs together tightly if the bed is more than one log in length. Mix in a 6 inch layer of compost to the dirt in the bed. Add more topsoil if needed to create a raised mound in the bed. The soil should mound up in the center of the bed and slope down toward the logs around the edges.